Down N' Out: Pokeburgers Pop Up Store open until Saturday 3rd September 2016. Sir John Young Hotel, 557 George Street, Cnr Liverpool Street, Sydney NSW. Pokeman fans alert! Whether you've loved it for twenty years, two months or barely know what Pokemon comes after Pikachu - we all can appreciate the efforts Down N' Out have made to capture the magic of the popular cartoon series and games that's been around for twenty years. 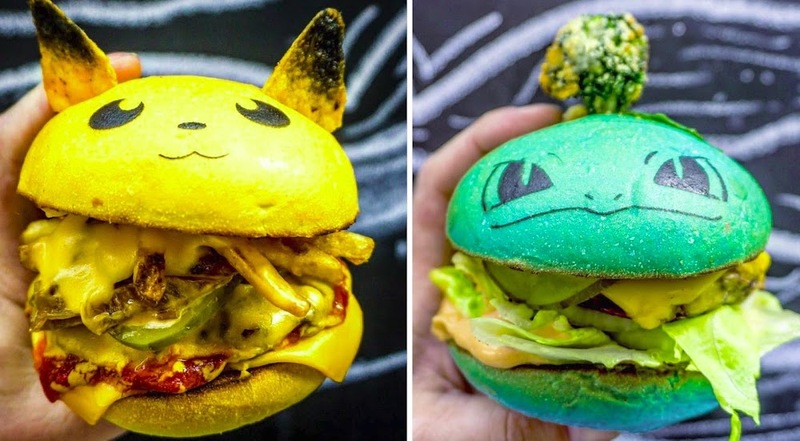 Down N' Out have created THE ultimate food craze - designing three burgers inspired by Ash's Pikachu, and two starter Pokemon - the grass type Bulbasaur and the fire type, Charmander. These $15 burgers have been dubbed the "Pokeburger" and were launched 22nd August. Each Pokeburger has it own flavour profile. 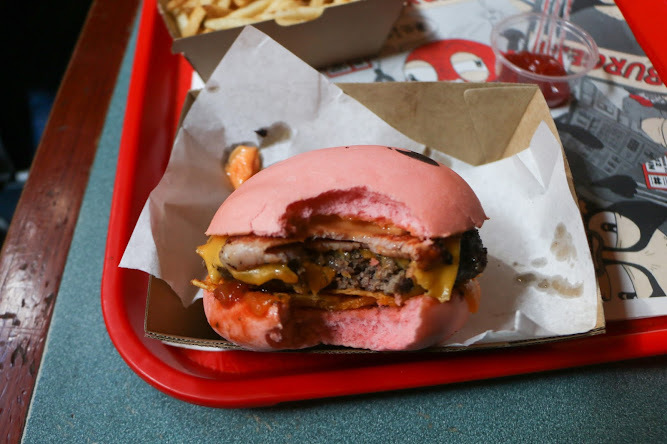 Although all contain a juicy wagyu beef patty, they all have different toppings. Pikachu is stuffed with Down N' Out famous 'tiger fries' which makes sense since he is electric type. Bulbasaur contains more fresh greens - lettuce, onions and pickles with a broccoli to replicate the bulb. Charmander is slightly spicy - crispy bacon drenched in a spicy mayo and dripping with melted volcanic cheese. With its tinted buns and cute character faces (and Pikachu's ears!) 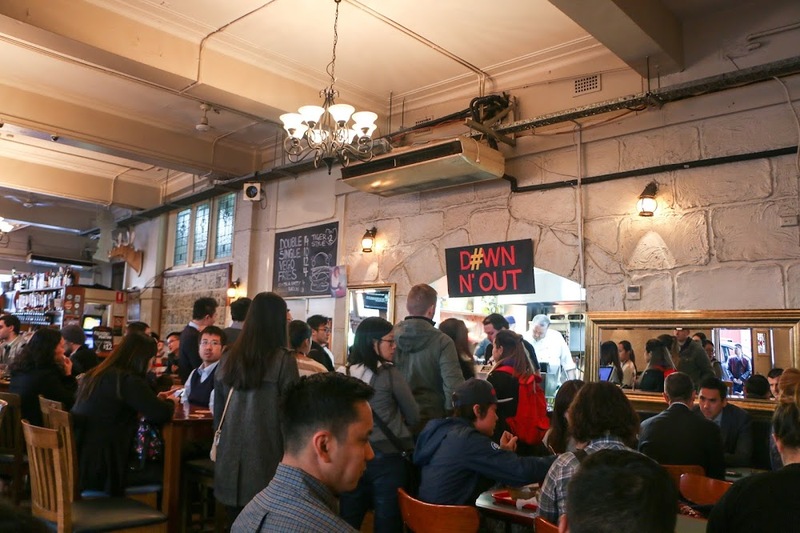 Down N' Out have been flat out with the high demand - now opening on Mondays to keep up. Most burgers are sold out within minutes of the store opening (between 12pm-3pm and 5pm-9pm) and another thing you have to factor in - customers do not get to choose their burger, everyone gets a Pokeburger flavour at random. In our case, our group of three managed to get three Charmanders. 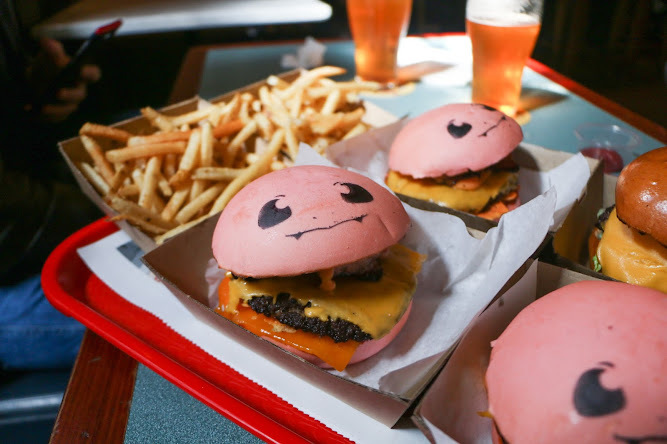 Considering ourselves lucky to even get a Pokeburger, we were impressed with how photo-worthy and cute the burgers were. Having abit of fun, we replicated Charmander's flame tail by sparking a lighter to create a small fire at the end of a bacon strip. And good news. 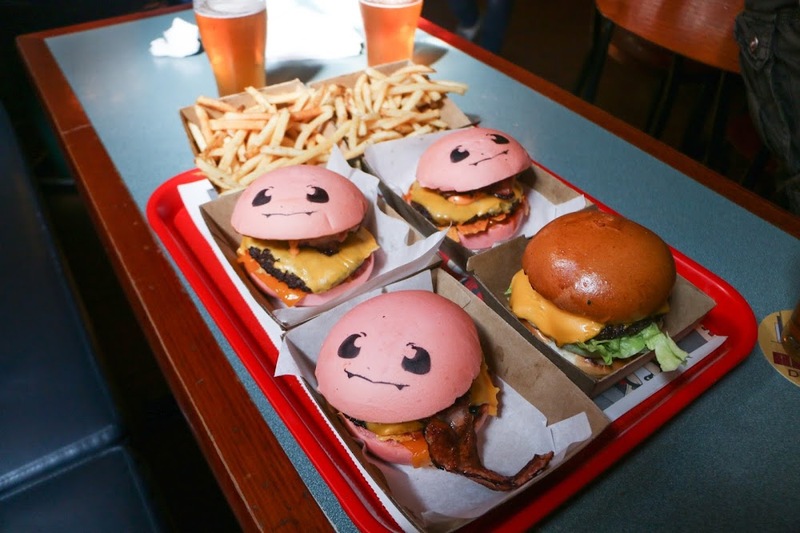 According to Food Beast, the owners of Down N' Out are creating concepts for Snorlax, Voltorb and Clefairy Pokeburgers. 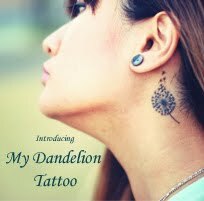 I personally can't wait for the Clefairy ones, I can imagine it to have puffs of pink fairyfloss everywhere or Moon stone designs. 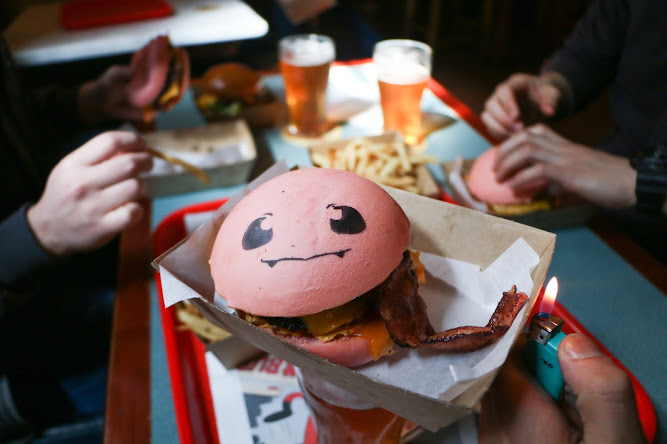 Currently there are only a limited amount of burgers available with the pop-up store ending the Pokeburger craze 3rd September 2016. Come down and enjoy them while you can - take a Pokesick day if you have to! It is well worth it to catch them all! I don't know... I'd probably eat one of those burgers. They look pretty good even looking like Pokémon. 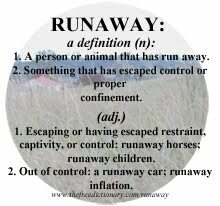 By the way... it's been a while since I've been here on "Lucy and the Runaways"!